For most researchers this is the golden standard for the measurement of stress. Heart rate variability (HRV) is measuring the variability between heart beats, if your pulse is 60bpm you might think that every second there is a heartbeat. It actually isn’t, the 60bpm is an average measured over 1 minute. In reality in that minute a few heartbeats could have been every 0.7sec and a few were every 1.3 sec eventually adding up to an average of 60bpm. The bigger the range the higher the HRV, and a high HRV is associated with parasympathetic activity (which is the body's resting system, read more HERE) and a good vitality of the heart. Above you can see what a HRV test of a person in stress (upper) or rest (lower) looks like. 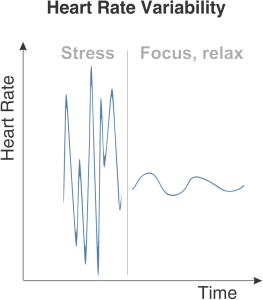 Stress is due to activity of the sympathetic nervous system and rest is due to the parasympathetic nervous system (read more HERE) As you can see the upper graph has a lot (high frequency) of small peaks an falls (small amplitude) compared with the lower graph which has a low frequency with a large amplitude. If you want to recover faster you want to be in the lower graph. How can you influence HRV? On the right you see a the illustration of a ECG heartbeats showing two heart beats. 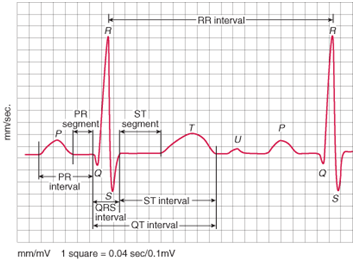 The peaks and falls are the electrical activity in the heart, the QRS interval is the actual heartbeat and the RR interval is the time between two heartbeats. 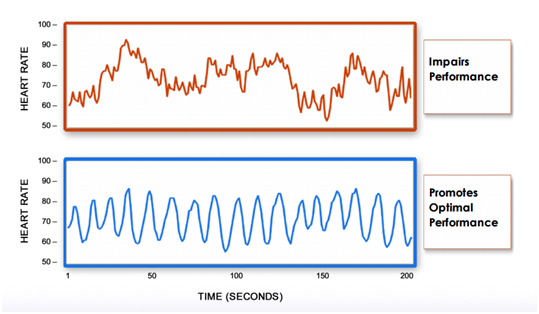 One of the ways HRV is being influenced is by the breathing cycle, when you take a breath in the RR interval shortens (time between two heartbeats) and when you breath out the RR interval widens. This is called the respiratory sinus arrhythmia (meaning deviation of heartbeats by respiration) and we can use that in our advantage. By focusing on a breathing out very slowly we can lower heart rate and increase HRV and thereby increase parasympathetic activity. This mechanisme is why yoga and meditation lowers stress. Lower stress by doing 7-10minutes of focus on breathing out. Inhale in 3sec and exhale in 9sec and train yourself to slowly increase the time you exhale. This will decrease perceived levels of stress [1,2,3,4,5,6], make the immune system more effective and lower blood pressure [7,8,9]. Those two are both very good options. Buying a device that can measure HRV is even more effective. By giving you live feedback a heart rate variability (HRV) monitor will teach you how to more quickly activate the rest/recovery modus of the body. The price range is between 30 for a simple device to 249 dollars of a high end device. Breathing excercises: Implications for heart rate variability and brain acitivity.